As I’ve mentioned a couple of times recently, my focus over the past 6 weeks has shifted from lutherie to more traditional joinery, specifically dovetailing. For a number of years now I’ve been nurturing a growing interest in furniture making (in no small part thanks to Chris Schwarz’s blog and the excellent books he publishes at Lost Art Press), and although my main workshop pursuit will always be lutherie, I’m starting to branch out into other ways to make sawdust. With the Anarchist’s Tool Chest course now only 2 weeks away, I’ve been busy reading my copies of The Joiner and Cabinet Maker and The Art of Joinery and cutting practice dovetails to prepare for the high number of dovetails I’ll be cutting on the course. My original plan was to cut 30 dovetails throughout June and July, and although rather predictably life got in the way on occasions, I still managed to cut 12 practice joints. Which is a decent amount of preparation considering the course (in theory at least) open to complete beginners. My first joint was (as you’d expect) far from brilliant. In fact it was downright awful, managing to somehow be impossibly tight to fit together despite having more gaps than the proverbial beaver with a meth habit. Which (to my mind at least) defies all the laws of physics. With the second attempt I switched to the tails first method and tried to be braver in cutting right against (but not on) the line for my pins. And the resulting joint was better, still nothing to shout about, but definitely better. So I persevered. And with Nos.11 and 12 (pictured above – the dark edges of the pins are no gaps, those are remnants of the pencil lines) they started looking like proper joints. Now there is still a way to go before I would want my dovetails on display, but the improvement in only 12 joints gives me cause for cheer. 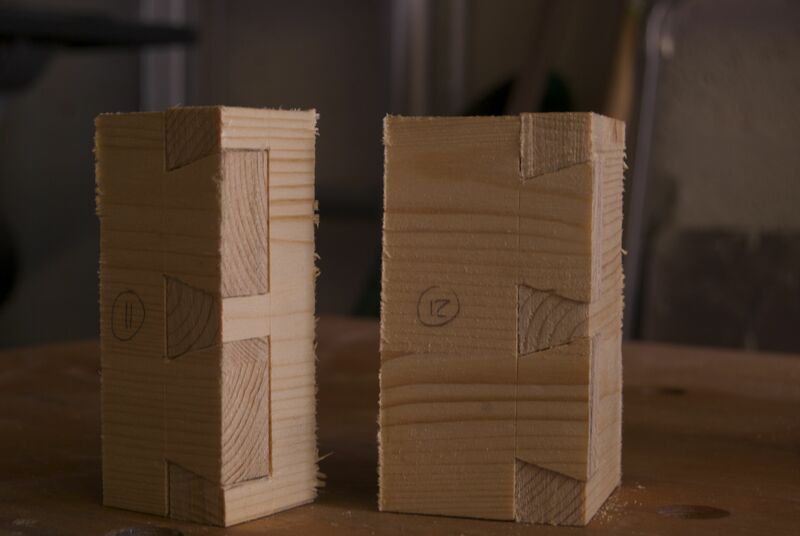 And I don’t think there is any mystery or secret techniques to getting a good dovetail; probably 90% of the joint is in (at least, in what I have seen to improve my own work) accurate sawing – the ability to cut straight, and just to the waste side of the line. And that’s where the Night of 100 Cuts comes in. 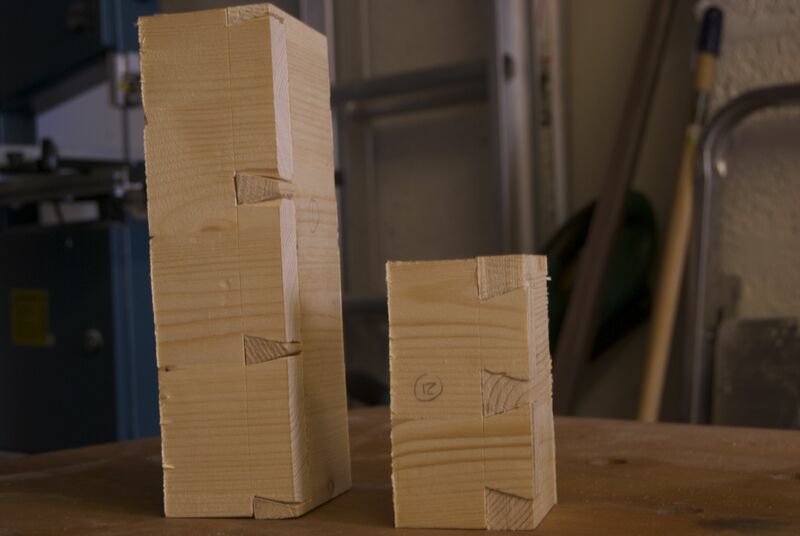 Above, practice joint No.1 and No.12, showing the improvement so far. Nice job! I totally agree; accurate sawing is the key. And those nights of 100 cuts make a huge difference in that. I noticed, in my own series of practice joints, that the way I mark the pins (I’m a tails first person) made a huge difference as well. How did you go about it? Thanks!! For marking out the pins I place the tails board on the end of the pins board (I cut a shallow rabbet on the back of my tail board which helps with getting a solid placement) and transfer the position of the tails to the pins board with a marking knife. I then mark the rest of the pins down to the baseline using a Sterling Tool Works Saddle Square. When it comes to cutting the pins, I’ve found the best way to cut just to the waste side of the line is to drop my thumb nail into the marking knife kerf, and hold the saw plate against my thumb nail. That seems to get me close enough to the line, without straying over it.